This is the first where the "gear" moniker is gone. Welcome to the Samsung Galaxy Watch. Currently, there is no pricing available for the Canadian model, so as soon as we know we'll pass it along. There are 2 main models, based on size, and then the bigger size has an LTE variant as well. These three Bluetooth devices will be eligible for a pre-order promotion beginning August 24th until September 20th. If you pre-order the Bluetooth Galaxy Watch during this period at Samsung.com, Samsung Experience Store, or Best Buy Canada you will get a wireless charger duo free (value of $149.99). Just in time as I'm noticing my old Moto 360 Sport is starting to lose battery life. SEOUL, Korea – August 9, 2018 – Samsung Electronics Co., Ltd. today introduced the new Samsung Galaxy Watch. 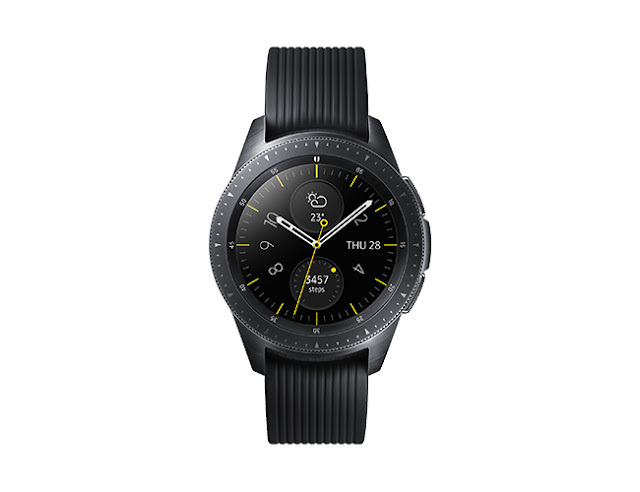 Galaxy Watch brings the best of the Samsung’s Galaxy ecosystem with long-lasting battery life, Bluetooth and LTE connectivity, wellness capabilities and a timeless and personalized design. Galaxy Watch helps users accomplish more with new fitness and sleep monitoring capabilities, in addition to offering a more robust line up of style options including three new watch faces in Silver, Midnight Black and Rose Gold, and new customizable watch band colors. Galaxy Watch’s improved battery life of 80+  hours eliminates the need for daily charging and helps consumers keep up with their busy week. With a longer battery life, untethering from their smartphone is now easy with Galaxy Watch’s LTE connectivity – across 30+ carriers and 15+ countries – for a true standalone experience across devices through messaging, calls, mapping and music. Users can also start and end their day with morning and evening briefings to help stay on top of reminders, weather and their latest schedule. Designed with wellness in mind, Galaxy Watch offers an improved wellness experience with a new advanced sleep tracker that tracks all levels of sleep, including REM cycles, to help users adjust sleeping habits and get the rest they need to take on their day. With sleep under control, Galaxy Watch also helps users achieve other personal goals including fitness. Galaxy Watch adds 21 new indoor exercises, tracking a total of 39 workouts that allow consumers to customize and change up their routines. Because balanced nutrition is as important as exercise, Galaxy Watch makes it easy to accomplish your goals with intuitive calorie tracking and personalized alerts. In addition, users can stay on track of their meals using Bixby Vision on their Galaxy device. Users can easily take a photo of each meal and instantly log nutritional information in Samsung Health and on Galaxy Watch for better calorie management. Galaxy Watch caters to more sizes and styles with a Silver 46mm version and 42mm option in Midnight Black or Rose Gold. Users can customize Galaxy Watch even more with a selection of watch faces and straps. Galaxy Watch carries the legacy of Samsung’s smartwatches with its trademark circular, rotating bezel while embracing the digital look with Always On Display, in addition to improved usability. For the first time, Galaxy Watch features analog watch ticks and hourly chimes, and a depth effect that casts shadows defining every detail on the watch face for a traditional look and feel. In addition, Galaxy Watch’s certified military-level durability with Corning® Gorilla® Glass DX+ and leading water resistance with a 5 ATM rating allows for long-lasting use, no matter the environment. Galaxy Watch brings users all the benefits from the Galaxy Ecosystem creating a seamless experience with SmartThings, Samsung Health, Samsung Flow, Samsung Knox, Samsung Pay, Bixby and with partnerships like Under Armour. Easily access and control devices on Galaxy Watch with SmartThings – all at the touch of a wrist – from turning on the lights and TV in the morning to adjusting the temperature before bed. Samsung makes music and multimedia control easy on Galaxy Watch in addition to keeping information more secure with Samsung Knox and easily unlocking PCs or tablets using Samsung Flow. · The Bluetooth Galaxy Watch will be available at Samsung Experience Stores, online at Samsung.com and at major retail partners across Canada on Sept 21st, 2018. The LTE device will launch in Canada later this year.